Chapter Two: Can ENRC save BAMIN? After being forced to quit the London Stock Exchange in December 2013 – six months after the UK Serious Fraud Office (SFO) commenced an investigation into ENRC’s allegedly corrupt dealings and corporate mis-governance – the three oligarchs who founded the company, Alexander Mashkevich, Alijan Ibragimov and Patokh Chodiev, took the company back to Kazakhstan – and privatised it [see Chapter One]. Nine months earlier, in March 2013, ENRC had to write down a US$1.5billion (£1bn) loss due largely to an “onerous” locked-in contract with the Russian aluminium company, Rusal, to which it now had to supply aluminium at below-market price [Daily Telegraph 13 March 2013]. Five weeks later, on 21 April 2013, the Sunday Times accused the three oligarchs of being behind a possible takeover bid for ENRC – a move which would violate provisions of the UK Companies Act. Within days, three senior executives resigned from the company and a fourth announced a “leave of absence”. Mehmet Dalman, the chairman of ENRC, also handed in his notice, promptly to be replaced by Gerhard Ammann, a non-executive director of ENRC and president of the private Swiss Bank, Bank Von Roll [Financial Times 24 April 2013] – an institution which prides itself on exercising “discretion” in dealing with clients. Thereupon, the SFO launched its criminal investigation into ENRC’s business practices, initially to determine if ENRC had breached Britain’s rules for listed companies, specifically with acquisitions made in the Democratic Republic of Congo, and a 2012 sale of railway line repair company Zhol Zhondeushi to a company connected with the family of one of ENRC’s co-founders [Reuters 30 April 2013]. In October 2013, Kazakhmys – another huge Kazakh metals conglomerate – sold its own stake in ENRC back to the company; and in December 2013, ENRC itself was technically taken over by ERG (Eurasian Resources Group), reflecting the company’s privatisation in Kazakhstan [Steel First 29 January 2014], but not suggesting any significant change in its control. As 2014 opened, the trio of oligarchs found themselves saddled with a huge overseas debt burden. First among its creditors were two Russian banks, Sberbank and VTB, which had loaned ENRC US$1.7 billion in 2012, for a period of five years, at an interest rate of about 7-9 percent. This was on top of ENRC’s own debt of about $6 billion – most of which had been sustained in the financing of various acquisitions around the world in previous years – including BAMIN. It seems that ENRC borrowed considerably more from the Russian banks over the coming months. By May 2013, according to the Financial Times, its total net debt still stood at $5.7 billion of which “US$4bn is owed to VTB and Sberbank – $2billion apiece” [Financial Times 13 May 2013]. Meanwhile, the company’s minority shareholders were becoming concerned about the future of the company – or whether it had one at all. Should they sell out before ENRC went any further downhill? Prominent among these shareholders was Russian billionaire, Suleiman Kerimov, who acquired a 2.86% stake in ENRC as the company’s share price hit a four-year low in April 2013. Kerimov’s motives for doing this seem fairly straightforward. According to the Financial Times, he was “understood to have communicated in writing to UK regulators that his interests are aligned with minorities in seeking a higher buyout offer [of his share] from ENRC” [Financial Times ibid]. Whether this foreshadowed a move by the Russian banks to actually take ownership of ENRC,starting by buying out the minorities was (and is) open to speculation. It’s therefore possible that Kerimov was not interested in helping ENRC survive, so much as safeguarding the balance sheets of VTB and Sberbank. Added the Financial Times: “Should the buyout deal fail, analysts fear the consequences could be disastrous for ENRC, potentially exposing its main creditors to losses” [Financial Times, 13 May 2013]. In February 2014, Reuters was in no doubt that the firm would “have to sell its international assets, including its lucrative copper mines in the Democratic Republic of Congo, following increasing pressure to repay the large loans they had taken out the previous year”. [Reuters 3 February 2014]. The Kazakhstan mines are potentially also up for sale. However, Reuters warned that there were two projects which “would be tougher to sell”. These were “ENRC’s iron ore project in Brazil [BAMIN] and a coal project in Mozambique… The Brazilian assets…lack a key port license. The greenfield coal project in Mozambique – close to Rio Tinto’s problematic Riversdale asset that triggered a write down of almost $3 billion last year – is competing with other, bigger assets for sale in the same area.” [Reuters ibid; see also Chapter Four]. To date, no mining company has offered to buy up any of ENRC’s mines, nor showed much interest in doing so. There has been some speculation, especially within Brazil over the last four years, that Glencore – the world’s most powerful minerals trading firm – might effect some link-up with ENRC, as the current owner of BAMIN, in order to access iron ore from its Caetite mine in Bahia [see Chapter One]. And, on paper BAMIN’s assets might be attractive to Glencore, if offered at a price it were prepared to pay. However, in reality, the current Pedra de Ferro mine-to-port project carries considerable liabilities, bound up with the mine itself – long-delayed in moving towards significant commercial output – and the problems of getting its product to the export market. Moreover, Glencore has existing interests and significant ownership in a number of other iron ore mines which are already in production or fairly close to it. It might well lay claim to other sources of iron ore that are potentially more rewarding than those belonging to BAMIN – notably at Simandou in Guinea (see Chapter Four, Ports in a Storm), elsewhere in Brazil and in Kazakhstan. In June 2011, before Glencore International could launch itself publicly on the London Stock Exchange (LSE), it had to reveal a very substantial amount of information that was previously kept secret. These set of data was set out in its pre-IPO (International Public Offering) document. That month, Metal Bulletin estimated the size of Glencore’s stake in the global iron ore market . This showed a growth from less than a million tonnes in 2008, to 9.3 million tonnes in 2011 [Metal Bulletin, 31 June 2011]. Earlier in the year, Glencore had signed “take-off agreements” ( or “off take agreements”) with two development stage iron ore miners. The first was with Core Mining, which is active in the DR Congo and Gabon. The second was with London Mining plc, whose Marampa mine in Sierra Leone was soon to come on-stream. The following year (2012), Glencore globally traded some 20 million tonnes of iron ore [Steel First 12 September 2013] . It was also “rumoured ” to be “eyeing mineral-rich Kazakhstan” as a new source of iron ore, having already made overtures to the Kazakh government in this regard. At around this time, BAMIN appointed Jose Francisco Martins de Viveiros, formerly with the world’s largest steel maker ArcelorMittal, to head up its operations. This followed four ENRC board directors resigning their posts, thanks to growing criticisms of the parlous state of ENRC’s internal governance..
Fast forward more than three years, and there still seems to be little or no prospect of ENRC raising any new funds from western commercial banks, whatever assets it has to offer. Instead, the company seems to be searching for global trading firms which are prepared to sign “take-off agreements” for the acquisition of future ore. If applied to the Pedra de Ferro project, such an agreement would commit trading firms to purchasing BAMIN’s Caetite mine output at preferential rates. Rather than footing the much larger bill of buying the project or the company outright, this process averts the risk of investing in a mine which – when push comes to shove – doesn’t deliver. The firm has an enviable flexibility: if supplies are for some reason restricted at one mine, they may be switched to another, since Glencore also controls a major global shipping network. Nonetheless, this involves some risk, and such substitution can be problematic, since the quality and grades of ores significantly differ across various operations. And, while Glencore is always on the look-out for potential new sources of ore, it faces internal constraints on costs, which continue to grow. Integrate iron ore operations across [the business], seeking savings of $19.3 million and slashing employee headcount by 50%. Assist new producers in Australia and Brazil with market entry, highlighting off take financing as a key factor. 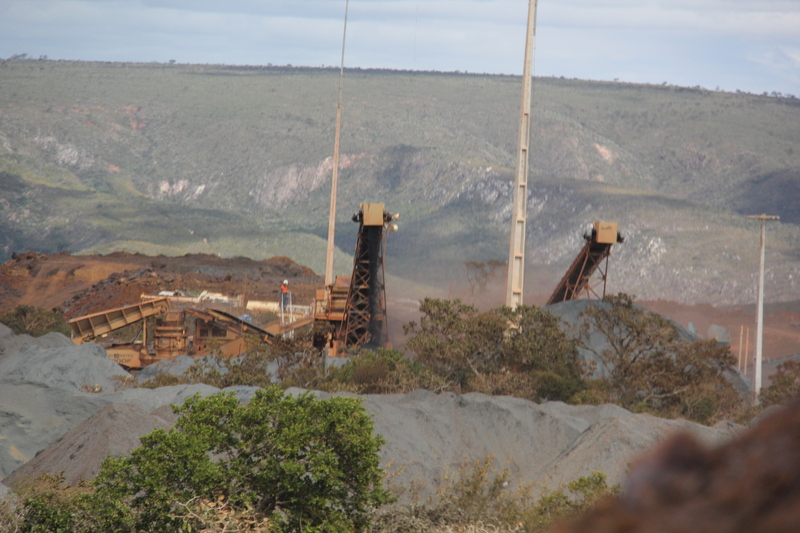 Market iron ore outside the traditional Pilbara and Brazilian specifications. Source material from a range of clients, from juniors to the big four – Vale, BHP Billiton, Rio Tinto and Fortescue Metals Group (FMG). Glencore called its iron ore model “asset light” with a slim “resource profile” of shares in early-stage mines. Among its “off take partners” were named West African producers London Mining, African Minerals, and Bellzone, as well as a US-focused magnetite producer, Strategic Minerals. In June 2014, Glencore also provided an example of the political influence it could wield to promote the fortunes of another of its mineral assets. It signed a long-delayed deal with the Mauritanian state-mining company, SNIM, enabled it to start exploiting the Askaf iron ore mine. Glencore has identified a 4% stake that it holds in Brazil’s Ferrous Resources which, combined with an off take agreement, it has said will “giv[e] it the potential to grow in Brazil” [Steel First 12 September 2013]..
Ferrous Resources has three operating iron ore mines in the state of Minas Gerais, and proposed construction of another one in Bahia, unrelated to BAMIN. For its part, Ferrous Resources appears still to be working on what it terms an “integrated logistics system”. This includes the development of a slurry pipeline across three Brazilian states, as well as “the construction of a new port terminal in Espirito Santo”. This plan is akin to the existing infrastructure system used by Vale-BHP Billiton’s joint venture Samarco. Over 20 million tonnes a year of iron pellets and concentrate is produced at their Germano mine in Minas Gerais, then slurried through a 396 kilometre pipeline to the Ponta Ubu terminal in Espirito Santo. To an extent it also compares with BAMIN’s design for Pedra de Ferro – the main difference being that this scheme does not (at least as yet), envisage slurrying production to port. Australian and Brazilian “material” last year made up more than 60% of Glencore’s marketed ore tonnages, with West African material accounting for 20%, and Canada and the rest of the world the remaining 18%. [Steel First ibid]. There’s no question that the firm will remain committed to making deals in Brazil and Australia; after all, these are by far the world’s two leading iron ore producing countries. But we shouldn’t leap to the conclusion that Glencore is seriously considering bidding for BAMIN. It already has sufficient commercial producers to choose from. One of these is Anglo American plc, which has “long been tipped as a possible takeover target” by Glencore [Steel First ibid]. In fact, there’s hardly any prospect of Glencore bidding for its fellow London-listed miner in the near future [Moneyweb 4 September 2014]. Nonetheless a core part of Anglo American’s portfolio is one of the most promising iron ore projects in Brazil, called Minas Rio, and this was certainly on Glencore’s horizon soon after it was permitted to open. Anglo American says Minas Rio will enter commercial production in the latter part of 2014, with output rising to around 25 million tonnes a year. That’s a far cry from from the prediction of Anglo’s then-CEO, Cynthia Carroll, back in in 2007 that it would produce “over 100 million tonnes [of iron ore] a year within five years” [Financial Mail 11 October 2013]. Minas Rio has suffered massive cost overruns, amounting to nearly US$ 9 billion – more than five times what Anglo American paid to acquire 49% of Minas Rio, along with a subscription of shares. During the 2012-2103 financial year, Anglo American had to write down the value of Minas Rio by no less than US$4 billion after tax [Financial Times 29 January 2013]. In October 2013, Charlotte Mathews, wrote in South Africa’s Financial Mail: “It is highly doubtful Anglo American would have embarked upon the ambitious US$8,8bn Minas Rio iron ore mine, pipeline and port in Brazil in market conditions like today’s” [Financial Mail, 11 October 2013]. (see also Chapter Four: Ports in a Storm). Almost a year on and those market conditions have become far worse (see Chapter Three). Glencore, or any of its rival commodities’ trading conglomerates, would be extremely foolhardy to mount an outright takeover of BAMIN. On the other hand, there is a distinct possibility that one or other of them might sign an iron ore delivery contract – a so-called “off take agreement” – with BAMIN, but only if and when commercial production (reaching, say, 10 million tonnes a year) starts. During summer 2014, Metal Bulletin reported that ENRC had “held talks with five of the world’s largest metal trading firms to outsource marketing rights to its products in exchange for pre-financing of material” [Metal Bulletin, 9 July 2014]. These firms were identified as Trafigura (second only to Glencore as a global metals trader), Traxys, Mitsui , Noble and Glencore itself. Some of these discussions were conducted in the first quarter of 2014, “but may have slowed or ended because ENRC secured more favourable terms from its banks without the involvement of the trading houses”, reported Metal Bulletin. Of course it is equally possible that it was Glencore and fellow traders who cooled on any “offers” that may have been put forward by ENRC, rather than the company itself. There is no evidence that the Kazakh oligarchs got anywhere with the banks. And just what would the “pre-financing [of] material” mean in practice?. The fact is the Caetite mine still has a long way to go before reaching a very modest annual output of one million tonnes a year. Many months are likely to pass before adequate rail and port transport were available to move that product to foreign customers. Glencore and its rival global players aren’t fools and – to coin a phrase – they “never count their chickens before they are hatched”. Pedra de Ferro is not a “Golden Egg”, by any stretch of the imagination. In reality, the egg hasn’t even yet been laid.